A really big one affecting 11 homes, nearly 200 feet in diameter. This isn’t the first sinkhole for this area. A growing sinkhole in Florida that has already swallowed two houses is now threatening other residences, authorities said Friday afternoon. Nine other houses have been evacuated in Land O’ Lakes, a residential area about 20 miles north of Tampa, Kevin Guthrie, Pasco County’s assistant administrator for public safety, said at a news conference. Power has been cut to around 100 houses in the neighborhood. 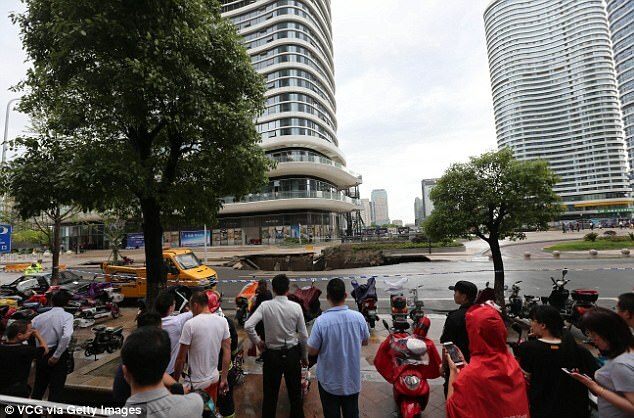 Online commentators speculated that an underwater pipe might have been leaking, causing the earth around it to collapse. Five reservoirs in the capital Nanjing were inundated as early as 9 a.m. Saturday. A nasty car eating sinkhole in Marion County and swallowed a car whole, according to the Ocala Fire Department. From our Hollywood correspondent, Paul Von Soucek: Breaking: The sinkhole was caused by a suspected leaking water main. A large sinkhole has formed in front of Mar-a-Lago, the Palm Beach estate belonging to President Trump. But where utility workers saw a repair project, the Internet saw a giant opening — for metaphors. Crews are digging around a sinkhole that opened in front of President Donald Trump’s Mar-a-Lago Club, but it’s still unclear what caused the hole. The sinkhole is just west of Mar-a-Lago’s southern entrance, where workers are gathered. What started out as a 4-foot by 4-foot hole in front of the club has grown to about 10-feet by 6-feet due to the digging, which required an excavator. The sinkhole is near a new water main on Southern Boulevard, though it’s unclear if the two are connected. Utility crews from West Palm Beach secured the sinkhole and have been doing exploratory excavation this afternoon. A massive sinkhole in Texas swallowed two cars on Sunday night, injuring one person and killing a reserve deputy, officials said. The Bexar County Sheriff’s Office identified the dead officer on Monday as seven-year veteran Dora Linda (Solis) Nishihara. An unidentified man in the second vehicle was rescued by a civilian and transported to a local hospital with minor injuries, San Antonio Fire Chief Charles Hood said during a news conference. The incident occurred on a two-lane road in a section of southwest San Antonio. In a statement, fire department spokesman Joe Arrington said crews responded to a water rescue shortly after 7:30 p.m.
What they found, Arrington said, was a broken 54-inch pipe and a pit measuring 10- to 20-feet deep that stretched the entire width of the road. Robert Puente, president of San Antonio Water System, told reporters Monday that the pipe was near two construction projects — one that was completed last year and one that was still underway. Puente said it was unclear what caused the pipe to rupture. Hood said Nishihara’s vehicle was 90 percent submerged and he didn’t know how long she had been in the water. From our special UK sinkhole correspondent, Sophie. Time to get the builders in… Seven houses have been evacuated after a sinkhole appeared in gardens in a North Yorkshire market town dubbed the sinkhole capital of Britain. Emergency crews were called to the 66ft hole in Magdalen’s Road, Ripon, on Tuesday night, the fire and rescue service confirmed. 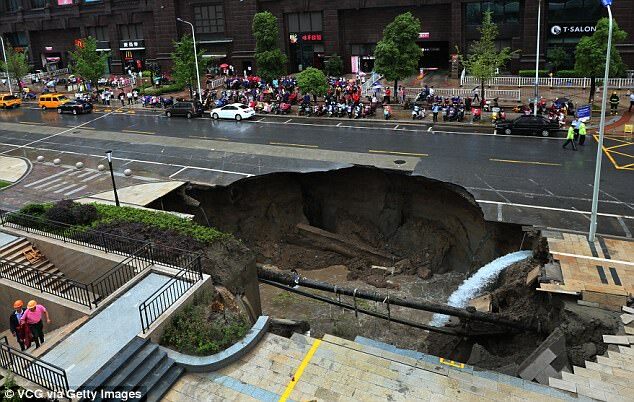 Householder Ben Bramley fell asleep watching snooker and woke to find his back garden had sunk down a giant hole. Bramley, 43, wife Adele, 40, and their son Joshua, 17, heard an alarming noise outside at about 10.30pm on Wednesday and rushed outside to find their garden had been swallowed. Two neighbouring properties lost the edges of their gardens and the entire row of 1930s terraced houses was quickly evacuated. Residents of seven houses had to sleep in hotels, the neighbouring pub or with relatives. Bramley, a project manager for bookmaker William Hill, said: “I had fallen asleep watching the snooker on telly when my wife ran in absolutely frantic, shouting that something was happening outside. “I could hear the strangest noise, it wasn’t massively loud it was more like a hissing, like sand slipping. It was obviously coming from behind the house and we rushed out to find total devastation. “All that was left was the paving that led to the garden and a massive hole that had come within 10ft of the back door. “In the dark it was hard to tell the scale of it but it was clear that there was a hole of epic proportions that had taken our entire garden and the flanks of our neighbours’ gardens. “The elderly lady who lives next door was outside in her nightie and was very distressed, but we were helpless, there was nothing we could do except call the council and the fire brigade. “They arrived extremely quickly and took control – we were told it was safest to leave as quickly as possible. We went to stay with my parents who live nearby and I returned in the morning to assess the damage. “The first thing that struck me when I saw it in daylight was how close it had come to swallowing up the house, so in that respect we’re lucky. The hole is 20ft by 10ft wide and I’d say 30ft deep at least, with our garden furniture somewhere at the bottom. The future of his £160,000 two-bedroom terrace, which he and his family have lived in since 2003, is unclear. A spokesman for North Yorkshire fire and rescue said: “Two fire crews and an officer from Ripon attended a sinkhole that had appeared at the rear of two properties. There were no injuries but seven properties were evacuated. “The hole measured approximately 20 metres by 10 metres, with an unknown depth. An 8 meter-wide hole was first reported early Tuesday, according to Motohisa Oda, a crisis management officer from the city of Fukuoka. 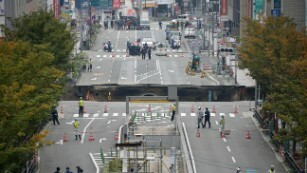 Nearby residents were evacuated, and five major roads cordoned off in Hakata ward in Fukuoka’s business district. The gaping hole — which started off as two smaller ones before merging into the larger cavity — appeared 300 meters from the JR Hakata railway station. 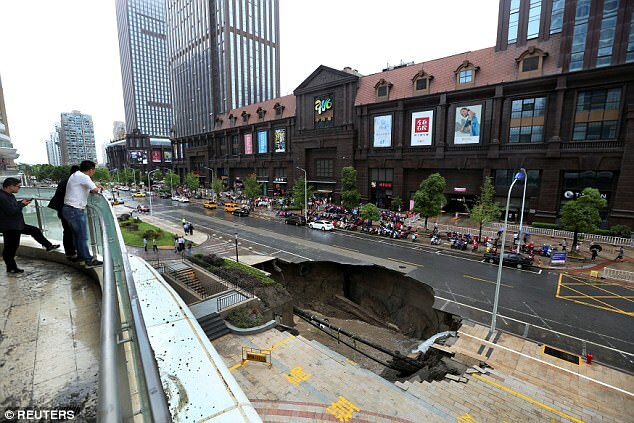 The sinkhole is now a whopping 27 meters wide, 30 meters long and 15 meters deep. It is filled with water that seeped in from sewage pipes destroyed by collapsing sections of road.